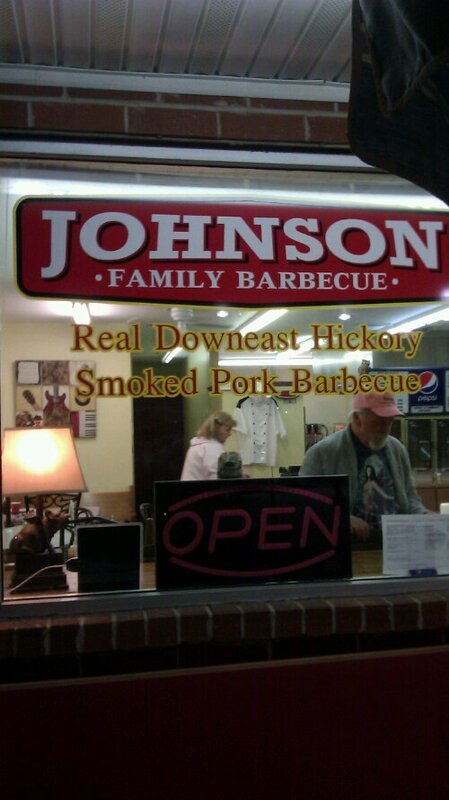 That is not downeast bbq. It’s undercooked like they do it in Lexington. JayL- you’ve eaten there? And please explain your comment. I’m not aware of “Lexington” consistently undercooking BBQ. I am not sure what Jay L means about Lexington–and disagree that Lexington joints undercook their ‘cue–but he is right about Johnson Barbecue based on my one trip there. It was not particularly tender and tasted undercooked–not UNcooked, mind you, but not quite barbecue. They’ve been open less than 2 months so hopefully they’ll improve and I am happy to see they are burning wood rather than gas. I will never go here again. Tried going once after looking up the hours of operation on Facebook and Yelp and finding out that they were closed upon arrival (arrived at 6pm when the hours listed a 7pm closing time). The sign on the window also listed a 7pm closing time, so we knocked on the door and was greeted by a lady who didn’t seem to care that we were inconvenienced by driving there and dismissed us. She was rude and never even apologized, even when we pointed to the Hours of Operation sign right next to her. Two of the people with me had even driven from out of town to have dinner! She made us feel as if it was OUR fault for arriving when they were closed, when it wasn’t. Later that evening Johnson Family Barbecue posted on their Facebook page, referenced our 6pm visit and, in my opinion, was completely rude and disrespectful. I responded on their facebook wall, expressing my feelings on their post and it was deleted shortly after. I can’t express enough how much I will never give this place my business. What a shame. By saying “undercooked” I meant that the pork in the picture was not cooked to the point of “pulling”. It is cooked, but it is cooked like much bbq around Lexington where you can order coarse chopped. See the larger, squared off chunks on the plate? That bbq would not have pulled or fallen apart on it’s own like that in the east does. I guess to each their own. I couldn’t disagree more about their BBQ being undercooked. I live 5 minutes’ drive from Allen & Son and it’s always been my favorite BBQ joint in NC. But JFB is now my favorite BBQ joint. Both A&S and JFB have that smoky BBQ that I love. But what sets JFB’s BBQ apart is its texture. 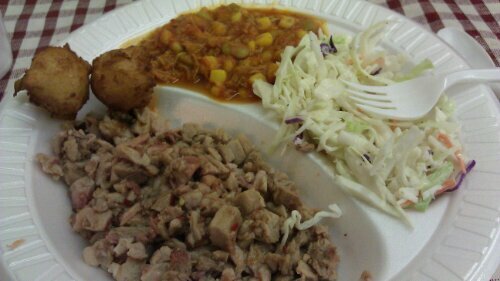 I’m not a fan of the stringy texture of pulled pork or the mushiness of the uber-chopped pork at a lot of BBQ joints. The bite size chunks of cue at JFB is the texture I like best. Plus, they make some killer fried chicken! They have ribs only on Thursday nights. It’s fine but the pork and fried chicken are much better. Oh, if they made their banana pudding grab some before it’s gone. They top it with meringue instead of the ubiquitous whipped cream!